Sometimes, amidst the stress of multiple converging deadlines and the endless hustle to obtain new clients, it can be hard to remember why we chose to become self-employed in the first place. It’s all too easy for freelancers to focus on “clients from hell” and the daily little frustrations that we encounter. We forget why self-employment is awesome. But fear not — in this post it is my intention to remind you exactly why being self-employed is so much better than working for someone else. 1. You’re your own boss. You knew this one was coming, didn’t you? It’s the one we all dreamed about when we realized self-employment was a viable option: being our own boss. Escaping the rat race and living life as we pleased. Remember that? When you’re self-employed, you no longer have a “higher-up” governing your every move. You control how your work is done. Your client has a say in the final product, but that’s it — their power ends there. How you get from point A to point B is completely up to you and that is awesome. 2. You earn more money. 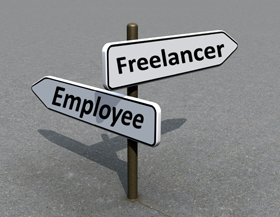 On average, freelancers earn 45% more than those who are traditionally employed. They’re also allowed to deduct certain business expenses that employees are not, allowing to actually keep more of what they earn. Feel like you’re not quite there yet? Check out my 7 Tips for Negotiating High End Rates. There’s no reason you can’t pull in just as much (or more!) money now than you did when you were traditionally employed. When was the last time you were stuck in traffic on your way to work? If you perform your professional duties from a home office, it’s most likely been a very, very long time. (And, no, waiting in line for the bathroom for your morning shower doesn’t count). Think of all the money on gas you’ve been saving. Even if you work outside of your home, as someone who’s self-employed, you were able to choose the location. And I’d be willing to bet you chose somewhere that nixed the lengthy commute. Child care expenses may also be a thing of the past for you. Along with expensive daily lunches “out” because of your distinct distrust of the office fridge. When you were an employee — whether you were crumbling away in a cubicle, restlessly working retail, or dying at the drive-thru — you were handed a manual or given some hasty instructions by your boss and then…that was it. You knew what you needed to know to perform your job, and there was never any reason to grow beyond that. Because your job never, ever changed. As a freelancer, your job is changing constantly. You’re expected to continually adapt, learn, and update your skills. With every new client comes a new challenge. When you’re self-employed, you’re forced to think — to be creative — and you love it, don’t you? (It’s okay to admit it. Go ahead. Take a second to say it out loud.). It’s a great feeling to know that your skills are being put to good use and that those skills are going to continue to grow as your business grows. Many of us work alone (or work remotely) and that isolation can be a bit daunting at times. But do you really, honestly, miss your co-workers? Even the one who listened to her music sans headphones? What about the guy who loved to talk (loudly) on his cell phone during his breaks…right next to you? Or how about the gem of a human being who shirked all of their cleaning duties on you? Your favorite co-workers became your friends and are likely still a part of your life in that capacity. Everyone else? Good riddance! A day we don’t work is a day we go without pay, but at least we can take that day off without having to beg for our boss’ forgiveness. Or feel the demeaning sting of having to prove how ill we were by providing a doctor’s note. Or fill out a stack of meaningless forms. Of course, we have to buy our own health insurance. But even that isn’t so bad; at least we get to choose which insurance we use. Our health coverage is no longer left up to a head honcho choosing the cheapest package. 7. Your work area is truly yours. Want dual monitors instead of one? Go ahead. Prefer a standing desk? Knock yourself out. And framed photos of your friends and family? The more the merrier! Decoration regulations (try saying that ten times fast!) are a thing of the past. You can Feng Shui your work space to your heart’s content. So put up that poster you found online, get in the habit of watering your indoor fern, and finally buy that ergonomically correct chair! Need some inspiration? Check out these pics of 60 jaw-dropping home office setups. Even if you already have a killer home office, improvements can always be made. 8. New equipment when you want/need it. If you’ve ever worked in an office building, you’re well aware of the frustrations that come along with the I-need-something hierarchy. Whether you need a new pack of pens, staples, or laptop repair, as an employee you would have to ask someone for the equipment you needed. And then they would ask someone else, who would ask someone else, who would ask someone else. It could take anywhere from a few hours to a few weeks to get the equipment or maintenance you needed in order to complete your project. Need something now that you’re a freelancer? Go to the store and get it. Get back to work. The end. Being self-employed is a bit like being Phil Collins: No Jacket Required. Also, no tie required. No neon polyester t-shirt. No two-toned logo-covered baseball cap. Unless you’re meeting with a client in person — or via video chat — you can wear (or not wear) whatever you darn well please. It might be a cliche to freelance in the buff, but it’s definitely an option. 10. You set your own schedule. Whether you crave the steady familiarity of a fixed schedule, or you long to mix it up with hours that are more flexible; as your own boss, you’re the one who creates your schedule. If you’re not a morning person, you can rest easy knowing that you no longer have to set your alarms in triplicate in order to just barely make your morning meeting. Or, if early’s your style, you can set your hours for the dawn and have a full day’s work done before your kids get up for school. As a freelancer, you’re no longer part of the hive; you’re a highly-valued individual. More importantly, you get to decide what that value is, through a well-devised proposal like this one. You get credit for your own work. And, through your ongoing marketing efforts, you’ve even started to earn some name recognition, not just among your long-time clients, but from complete strangers as well. 12. You choose your own customers. When you work as an employee, you’re more-or-less forced to serve whoever decides to show up at your employer’s place of business. Whether it’s a bedraggled couple with two crying children looking to buy school supplies or the old man who screams at you because he still hasn’t quite figured out how the combo menu works or the confused woman who’s called three times in the past hour with the exact same customer service question: you had to help them. Because that was your job. If a client yells at you now, it’s because you chose the wrong client. You’re the one in control now, not them. You choose who you provide services to. When the stress of everyday life starts to wear thin on you, it can be hard to remember how amazing your life — your business — really is. You may even consider giving it all up from time to time. Truth is: self-employment is a fantastic lifestyle choice. Be thankful. If you ever forget why you chose to be your own boss, think back to what you were doing before you became a freelancer. Think about your worst customers, your most hideous dress code, your cramped work space, and your long commutes. If that doesn’t work, just come back here. I’ll remind you. Image courtesy of Stock.Xchng user cobrasoft (with slight modification on our part).